Kobe beef is notorious for two reasons: It’s incredibly good, and it’s incredibly expensive. What goes into a steak that costs $300USD per pound? Scotch whisky is typically made from the same ingredients as regular whisky. The main difference is that an alcohol labeled ‘Scotch’ must have been produced in Scotland (and also meet a number of other stringent guidelines). 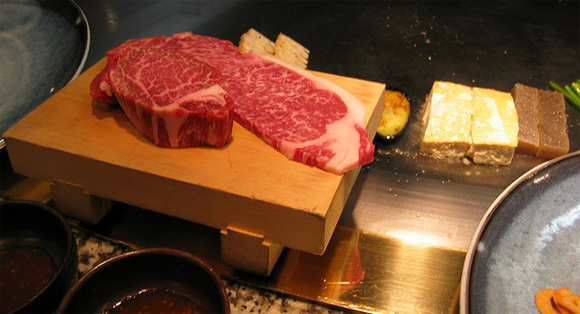 Kobe beef is similar to Scotch in that it’s really just a particular type of cattle that comes from a particular city. In this case, the only beef that may be labeled ‘Kobe’ beef comes from Wagyu cattle in Kobe, Japan. The Wagyu cattle breed is known for beef with intense marbling (intramuscular fat). Highly-marbled cuts of meat are juicier and more flavorful than their less-marbled cousins. Marbling is also a major factor in how a cut of meat is graded: Prime cuts have high marbling content and that label fetches a premium in restaurants and supermarkets. Think of Kobe beef as super-prime. Wagyu cattle farmers take careful care of their stead. One task that makes a day at the farm so long is the vigilant monitoring of the herd. The animal’s eating habits are observed and their physical condition is constantly checked, starting with the eyes. “I could increase the number of cows I raise by not doing all of this,” he says, “but then the quality wouldn’t be as good, would it?” The awards Nakanishi has won at competitions for his champion beasts attest to such perfectionism. 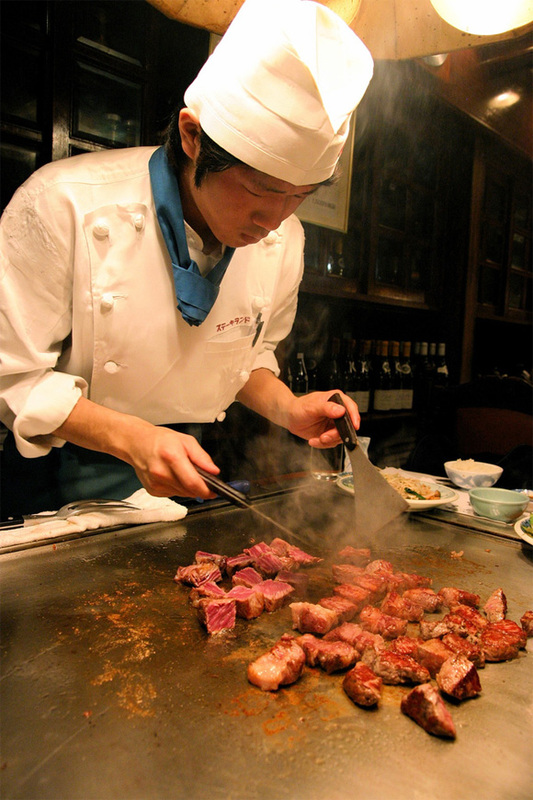 Japan’s supply of Kobe beef is limited by space: both for cattle and the grains that the cattle eat. Because demand thoroughly outstrips supply, ranchers in the United States and Australia have started raising “Kobe-style” beef. 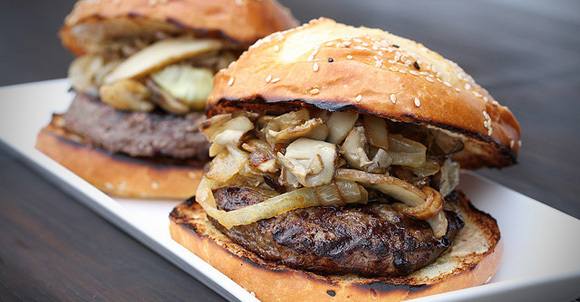 The massive increase in popularity of Kobe beef in the United States has led to the creation of “Kobe-style” beef, taken from domestically-raised Wagyu crossbred with Angus cattle, in order to meet the demand. Farms in America and Britain have attempted to replicate the Kobe traditions, providing their Wagyu herds with beer and daily massages with warm sake. U.S meat producers claim that any differences between their less expensive “Kobe-style” beef and true Kobe beef are largely cosmetic. The cattle are fed American and/or British grass and grain, which is different from the more expensive Japanese feed. Cuts of American “Kobe-style” beef tend to have darker meat and a bolder flavor. Kobe beef, no matter how you slice it, is the product of branding, genetics, and great care. Wagyu cattle farmers in Kobe, Japan, go to great lengths for their herds. They’re fed the good stuff, closely watched, and given a great life. Though Kobe beef is a bit pricey even for a care-free foodie, the cost is a reflection of the quality and love that goes into growing our food.